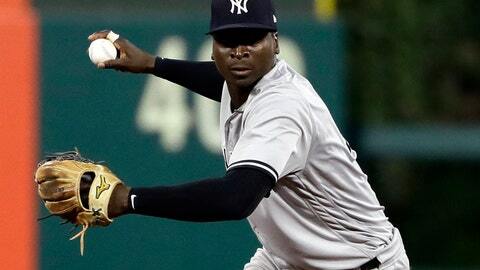 NEW YORK (AP) — Yankees star shortstop Didi Gregorius needs Tommy John surgery on his right elbow after injuring himself making a throw in Boston during the AL Division Series, and there’s no telling exactly when he’ll be able to play again. —Pitcher CC Sabathia had cleanup surgery on his right knee earlier in the day. He’s had surgery on the same knee in the past, and been slowed by trouble there in the past. The 38-year-old lefty was 9-7 with a 3.65 ERA in 29 starts this year, but struggled in Game 4 of the playoffs. Sabathia is expected to be fine for the start of spring training. He’s eligible for free agency, and Cashman said the Yankees haven’t held their organizational meetings to map out the future. —Pitcher Sonny Gray appears on his way out of the Bronx. An All-Star with Oakland in 2015, he’s just 15-16 with a 4.51 ERA since the A’s traded him to New York on July 31, 2017. The Yankees tried changing catchers to help Gray, but the 28-year-old righty still lost his spot in the rotation. —Boone said the team would work with pitcher Luis Severino to help him avoid tipping pitches. The problem, the manager said, will “pop up from time to time.” A two-time All-Star, the 24-year-old righty went 19-8 with a 3.39 ERA, but was hit hard by Boston in Game 3. —Boone, in his first season as a manager, and Cashman said they saw a lot to like in a club that went 100-62. But seeing the rival Red Sox clinch the AL East at Yankee Stadium and then watching them the ALDS in the Bronx left a sour taste. “Hate losing. Hate losing to those guys,” Cashman said.